Inflation nutters all!!! And that´s AFTER the Lehmann affair! @MattZeitlin Also a strong inverse correlation between being Richard Fisher and knowing what’s happening. 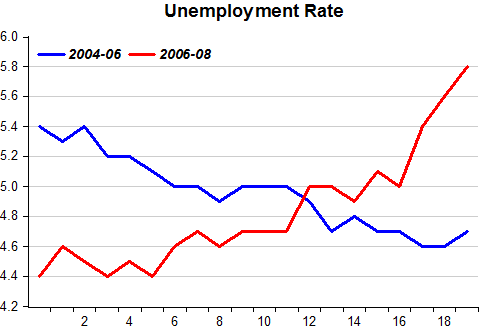 David Andolfatto of the St. Louis Fed also has a new post (“2008”) linking to the same speech. 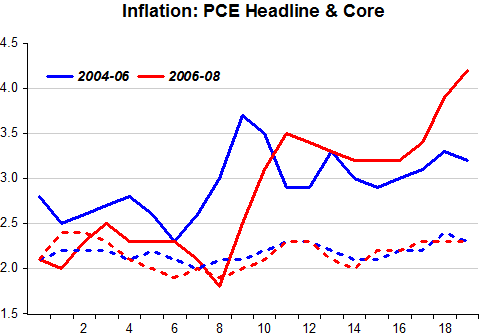 The FOMC transcripts show that St. Louis Fed President Bullard, as late as September 2008, was far more worried about high inflation than the possibility of a recession. 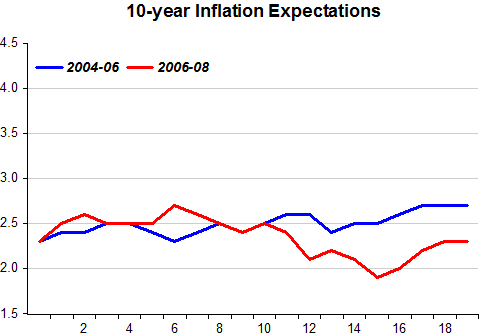 Inflation expectations as measured by 5-year TIPS closed at 1.23% the day before the September 16 meeting. Too bad he didn’t have as good foresight in 2008 as he evidently does now. A good and fun list of corroborating examples! As well as the excellent Benjamin Cole guest posts, can’t you get Mark Sadowski doing a few too? With Scott blogging less, this would become the go-to site for monetarists. You can now see, in the absence of rules, the “reaction function” of central bank governors is key. Greenspan good, Bernanke poor. 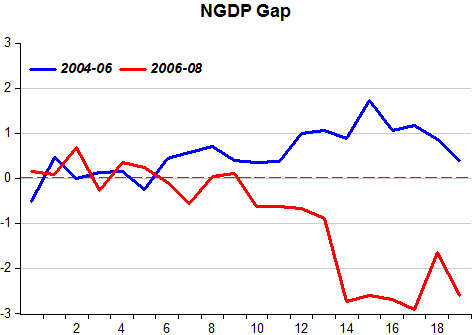 Mervyn King poor, Carney good (hopefully), as Britmouse likes to point out. MS has done a successful series on Richard Koo. I´ll pass your suggestion on. MS. YELLEN: Thank you, Mr. Chairman. witnessing a complete breakdown in the functioning of credit markets, and it is affecting every class of borrowers. The financial developments are dangerous and are having a pronounced impact on the economic outlook. The outlook has deteriorated very sharply, and even so, I still see the risks to the downside. Moreover, recent data on consumer and capital spending and on housing confirm that a sharp contraction in domestic demand is under way. As far as I’m concerned, for the reasons you gave, inflation risks have diminished markedly. Indeed, in a contraction as severe as that which is now on the horizon, I anticipate that inflation will decline noticeably below my own estimate of price stability. After the “horse has bolted” some (only some) see the “real” problem (which is nominal). 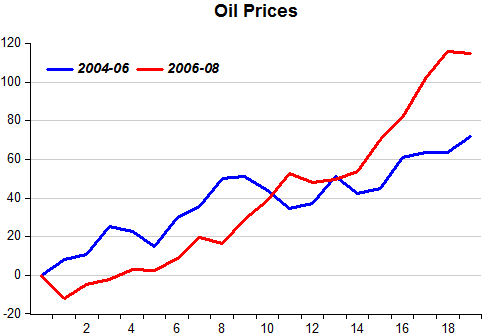 Pity they were so ‘conservative’ 10 months earlier (Dec 07). 50 bp then would have made a significant difference. 2) The “we blew up the economy, but at least we retained our credibility” award. 3) Richard Fisher on December 16 lecturing the rest of the FOMC on effective monetary policy communications (you can’t make this stuff up). 1…China had begun Selling GSEs and Buying Treasuries with real money. This is called a Flight to Safety and leads to lower yields. 2…There was a Special Trading Session held on the Sunday before the Monday of Lehman’s Bankruptcy to allow some buying and selling of Lehman Investments, I suppose, during which the Traders, also people with real money, spent their time discussing what to do when Merrill-Lynch filed for Bankruptcy during the coming week, unless they were saved. They were already discussing a financial disaster. I was discussing the monetary policy actions before the time frame you mention. I understand. I meant that the Fed had not been paying enough attention to China’s Actions and what Traders were saying going into that fateful Monday in Sept. 08. Obviously, they had been seeing something different from what the Fed was seeing in the previous months, especially after Bear Stearns. I was focusing upon the Myopia and Obsession with Certain Indicators that could lead them to make such a major mistake in assessing what would likely occur if Lehman Declared Bankruptcy. I’m saying that they would have been better off focusing on my two examples, as well as ones others, I’m sure, could come up with. It’s not just about Charts in the Real World. Agree, they were looking in the wrong place the whole time…until disaster found them! In 2008 Fisher told the Council of Foreign Relations that the economy would skirt a recession…in 2009 he told the Japanese that “I consider inflation an evil spirit that rots the core of economic prosperity and must never, ever be countenanced.” That was in Japan, btw. You have to wonder about Fisher. If he had been Fed Chairman, we would be in the Great Depression…but he is unabashed. Fisher missed his real career, which was as a boxer. No matter how hard he gets hit, no matter how many times he goes down, he just bounces right back off the canvas. BTW, in going through the transcripts, I find rare, almost no references to unit labor costs. They talk incessantly about oil, commodities, real estate—but the big basic is never talked about. And sadly, when the FOMC board is advised on unit labor costs, they get it wrong. A Fed staffer told the FOMC board in June 2008 that, “Accordingly, we expect the rise in trend unit labor costs, shown in the table to the right, to hold steady at about 2 percent per year over the projection period.” So several years of 2 percent hikes in unit labor costs. The real story is that unit labor costs have increased 1.7 percent since the first quarter…2007. Perhaps 0.3 percent a year increases in unit labor costs. I again call for Fed staffers to have salaries tied to real growth in GDP, with a high beta. Staffers now have an incentive—since they have a sinecure and do not work in construction, manufacturing, or retailing etc—to fret about inflation, not growth.